ABILITY IN THE CRAFTS IS WASTED, SAYS MISS ADDAMS. Settlement Leader Declares Skill Among Foreigners in Chicago Is Not Appreciated. 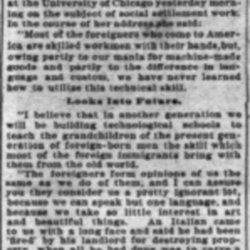 While manual training is being taught in Chicago schools, and while efforts are being made to promote the "arts and crafts movements," a great amount of ability as craftsmen is going to waste among the foreigners in Chicago. "Workmanship that would do much to end the hideousness of environment" in the foreign quarters of the city is being stifled by the [machine-like] work of the factories. 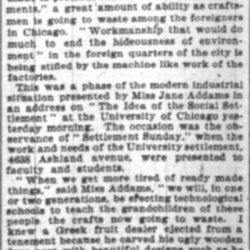 This was a phase of the modern industrial situation presented by Miss Jane Addams in an address on "The Idea of the Social Settlement" at the University of Chicago yesterday morning. 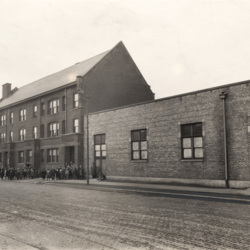 The occasion was the observance of "Settlement Sunday," when the work and needs of the University settlement, 4638 Ashland avenue, were presented to faculty and students. "When we get more tired of [ready-made] things," said Miss Addams, "we will, in one or two generations, be erecting technological schools to teach the grandchildren of these people the crafts now going to waste. I knew a Greek fruit dealer ejected from a tenement because he carved his ugly wooden door post with beautiful designs such as he had employed in decorating a church at home. The landlord, if in Greece, would probably go into raptures over the kind of work for which he turned out his tenant here. We need to give these people a chance to develop their crafts." 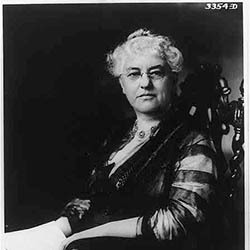 Miss Mary E. McDowell, head resident in the University of Chicago settlement, said the institution was a center for philanthropic work, serving as a depot for the distribution of pasteurized milk and an office of THE TRIBUNE free ice fund. She said many people came for advice, one having asked how to get the best sort of wife. Summer students were invited to assist in the work. 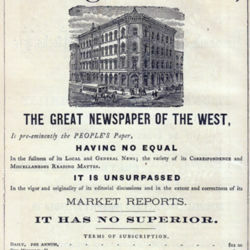 An excerpt of Addams' talk at "Settlement Sunday," held at the University of Chicago. Ability in the Crafts is Wasted, Says Miss Addams, Chicago Daily Tribune, July 13, 1903, p. 3. 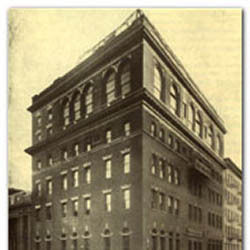 Addams, Jane, “Idea of the Social Settlement, July 12, 1903 (excerpt),” Jane Addams Digital Edition, accessed April 25, 2019, https://digital.janeaddams.ramapo.edu/items/show/6721.